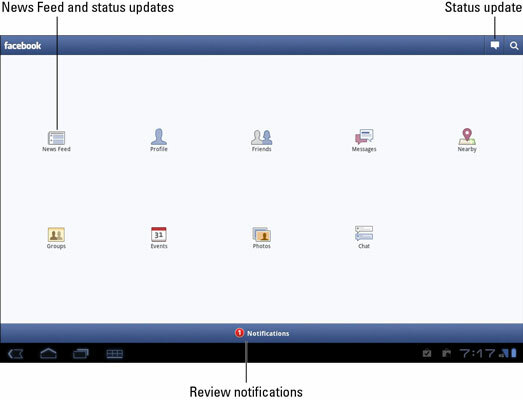 The Galaxy Tab doesn’t come with a Facebook app, but you can get the Facebook app for free from the Android Market. That app is your red carpet to the Facebook social networking kingdom. To get the Facebook app, you can scan the barcode shown in the margin. Or, you can go to the Android Market and search for the Facebook for Android app. The first time you behold the Facebook app, you’ll probably be asked to log in. Do so: Type the e-mail address you used to sign up for Facebook and then type your Facebook password. Touch the Login button. If you’re asked to sync your contacts, do so. Choose the option Sync All, which brings in all your Facebook friends to the Tab’s Contacts list. Touch the Finish button to begin using Facebook. Eventually, you see the Facebook news or status updates feed. To go to the main Facebook page touch the Back icon button.